A summary of today’s show: George Weigel discusses with Scot and Fr. Chris the interior life of Bl. John Paul II, his courage, his Christian discipleship, and devotion to both the Divine Mercy and the Blessed Mother, as well as three surprising things that George learned when writing about the Pope. 1st segment: Scot welcomes Fr. Chris to the show. Fr. Chris has known George a long time, dating back to when he was studying philosophy at Catholic University of America. He was one of Fr. Chris’ parishioners. George is an incredible supporter of the priesthood and how the Church is a gift to the whole world. Scot is excited to get his insights on last month’s beatification. Fr. Chris said he has written the definitive biography of John Paul II, showing how the Pope was a son, a factory worker, a priest, a skier, and the full gamut of the man. Scot said this is the 60th broadcast of The Good Catholic Life, and he reflects on the gift that 24/7 Catholic is in the Archdiocese of Boston. Fr. Chris hears about it from parishioners, seminarians, and his fellow faculty at St. John’s. He also hears from the men at Norfolk prison where he ministers that it is a great gift to them as well. Scot said since his early days at the Archdiocese in 2006, Cardinal Seán has always talked about evangelization, but in particular on the radio in many languages, including English, Spanish, and Portuguese. Scot thanked WQOM and the Station of the Cross to make English-language Catholic radio possible in Boston. Fr. Chris said the Church has a wonderful message to proclaim and we have to find new ways to reach people constantly, including those who might not be going to church now. Some of Scot’s favorite segments are those where he talks to priests and seminarians and he’s looking forward to next week’s shows where he will talk with the newly ordained priests who were just ordained for the Archdiocese of Boston. The day after the beatification, the radio studio was dedicated to Blessed John Paul II and so he’s happy to learn more about Pope John Paul from George Weigel. 2nd segment: Scot and Fr. Chris welcome George Weigel to the show. 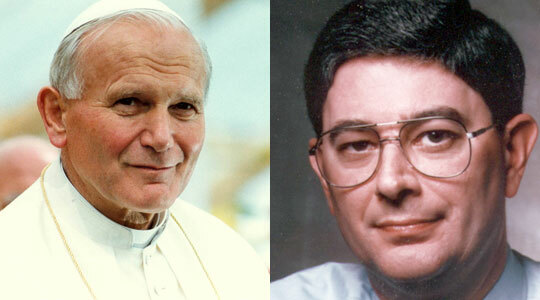 He is the definitive biographer of Blessed Pope John Paul II. John Paul’s beatification has been a prime topic of conversation on The Good Catholic Life. One of the statements John Paul made to George was that people often know him only from the “outside”. He could truly only be understood from the inside. Scot asked George what are the central aspects of his interior life that defined him as a heroic Christian disciple? George said you saw some of them displayed on the tapestry that was unveiled on the loggia of St. Peter’s Basilica during the beatification Mass. It was that twinkle in his eye, a wonderfully natural and warm human being, with a great natural capacity for love, which was amplified by supernatural charity. He had made himself into a kind of channel by which grace poured into the world. Literally millions if not tens of millions who saw and met him felt themselves ennobled by that. Another facet revealed in the tapestry is the white zuchetto (skullcap), which was slightly askew. He was a man of great humility who cared nothing for ecclesiastical finery, who was every bit as much at home in kayaking gear as in papal vestments, and yet who understood he was called to public role which led him to develop a great public voice. George has often said that John Paul II was not a man for whom raising his voice came naturally, but faced by Communist oppression he learned to raise his voice in a distinctive was as a Christian pastor. That’s how he empowered people to take back control of their own lives from an oppressive regime under which they were living in Communist Poland. In terms of other human qualities, John Paul II was the most relentlessly curious man George has ever met. He was in no sense interested in looking in the rear-view mirror. He was always interested in looking forward to discern what the Holy Spirit was doing in the Church and the world. He had great pastoral instincts and remembered people and their problems over years and decades. His remarkable energy came out of his intense prayer life. On great public occasions, he would almost withdraw into himself to charge his spiritual batteries, by the power of his own distinctive dialogue with the Lord. The work of the grace of God was palpable in him, and that’s why 1.5 million people came to Rome on May 1, to touch that again. Fr. Chris said speaking of those 1.5 million people, George has spent many a summer in Poland doing research for his book, educating the young of America and Europe, about John Paul II and Catholic social teaching. What was the sense from the Polish people who were present for this great event? George said this was in some sense a great validation of the Polish experience in the 20th century, which was very difficult, and in many Poles’ minds was redeemed by having raised up this great son of Poland who became such an extraordinary figure in the Church and the world. The challenge for the Church in Poland today is to start looking forward. George published a piece in a Polish magazine the week after the beatification in which he suggested it is now time to internalize the teaching of John Paul II and to move forward and look forward, rather than look backward over their shoulders at this great figure. That’s a good message for the Church in the US as well. There are many people who take daily inspiration from John Paul. What he would want us to do is to not look back, but ahead. 3rd segment: Scot said one of Pope John Paul’s virtues was that of courage and his first words as Pope were “Be not afraid.” Where did his courage come from? Was it the way his father raised him? The circumstances he dealt with early in life? His deep prayer life? George said it’s all of the above. One learns the virtues by imitating virtuous people and he was surrounded by men and women of courage. He had to manifest that courage during the Nazi occupation of Poland. But the courage he exhibited as Pope—and not just the courage to come back from an assassination attempt or to face the drumbeat of dissension and misapprehension, including from inside the Church—the courage to take the Gospel into the world. It took enormous courage to launch the World Youth Days. When he was elected Pope in 1978, 90% of bishops in the developed world were convinced that there was no sense speaking to young people. They lived on a different planet. John Paul believed you could take the Gospel to them. It took courage to take the Gospel to Central and South American in the 1980s, when it was riven by all sorts of false gospels, including liberation theology and national-security states. It took great courage to announce and see through the Great Jubilee of 2000, which most of the Church’s leadership was no interested in 1994. He had the insight and courage to see this as absolutely necessary. That’s the courage that comes on the far side of Calvary, comes after Good Friday when the answer is given on Easter. It comes through the long pilgrimage of Christian conversion, through the experience of the Cross. It allows one to live not simply without fear, but beyond fear. Fr. Chris said part of the secular media when John Paul was ailing toward the end kept saying that he should retire. Instead he stayed on and taught us a great deal about suffering and death. What would be the central messages from his remaining on as Pope? George said he wouldn’t limit that to the secular media. Those at Commonweal, the National Catholic Reporter, and the Tablet were the echo chamber for the ambient culture and were eager to get rid of this guy that they didn’t much like themselves. He had a wiser view, that this was an office of paternity and as long as he could exercise that in a distinctive way that’s what he was called to do. What he did over the last two months is what George called in his book “The End and the Beginning” the last encyclical. It was his last great teaching moment. He led the world in the great experience of the mystery of the suffering and death of Christ. He showed how suffering can be ennobled by its conformity to the Cross. That was his last great priestly effort and teaching moment. The Church and the world are all the richer for it. There was a sense in Rome on May 1 of people saying thank you for many things, but one of them was that period. Thank you for lifting up the inalienable dignity of the human person. Thank you for confronting the notion that suffering has no meaning. It was a remarkable last pouring out of a priest’s self and doing what priests do. 4th segment: In his syndicated column, George said we can lose the sense that saints are people like us, who by the grace of God lived lives of heroic virtue, a truth of the faith which John Paul II never ceased to remind us. Then he hoped that the Catholic community would remember two things about him: First, that he was a radically converted Christian and disciple, and second, how fond he was of the Divine Mercy devotion. George said it’s important to remember that while this man was someone richly given a wide range of natural gifts and while he was also given genuine mystical gifts, none of this would have been received had he not as a young adult made the fundamental decision to pour out his life in service to the truth that Jesus Christ is the answer to the question that is every human life. He was so seized by the truth of God in Christ as a young man, that he decided to pour out his life in that and everything he did from then on as a young priest, as a young scholar, university chaplain, philosopher, literary man, a bishop, father of the Second Vatican Council, statesman, and a Pope was done as a consequence of that discipleship. That’s what made all that possible. And while most of the rest of us are not going to be as gifted naturally and even supernaturally, at least in the mystical sense of that, we have all been baptized in the possibility of radical discipleship. That’s the point of connection between his life and ours. As far as Divine Mercy goes, John Paul II had a powerful existential sense of the terrible tears that had been torn in the moral fabric of humanity during the 20th century by grotesque and murderous ideologies, by World wars, by failure to understand the sanctity of the human person. All of it was like shredding a great tapestry. That’s why he thought that spreading the devotion to Divine Mercy was not a gift for Poland in the mid-1930s alone. It was a gift through Poland to the rest of the world. This was the face of God that a guilt-ridden world most needed to see. It needed to see and experience the possibility of repentance, confession, and forgiveness. And that’s why he was right to do so. Fr. Chris said both of the biographies are wonderful books. He asked how it is that he came to write them. George said the simple answer is that he decided to do it. In the spring of 1995, he proposed the possibility of a full-scale biography of the Pope to various people in the Holy See. John Paul II indicated in December that he thought it would be a good idea. George was following his own vocational sense, that it needed to be done, that he had a distinctive preparation for it, both in terms of experience and academic training. And it was a great ride for 15 years. He’s very grateful for being given the opportunity to do this. Scot asked if he was surprised that the Holy Father wanted a definitive biography written about him and by an American versus by a Pole. George said he didn’t think anyone thought it would be definitive until he delivered it. Other people had made attempts and there was a lot of frustration with them, that they just didn’t get John Paul. A criticism of Tad Szulc’s biography was that it was like someone writing a biography of Michael Jordan who didn’t like basketball. You’ll get something, but not going to get most of it. George thinks John Paul was interested in having the story told right and he was happy to be able to do it. Fr. Chris asked what surprised him the most in doing the research and writing the books that he never knew before. George said in the newer book, “The End and the Beginning”, there was a treasure trove of materials from the Communist secret police that had not been available when researching the first book “Witness to Hope.” Those files tell a remarkable story of the Communist war against John Paul II going back 40 years. That’s all new material in English. In the broader scheme, the three things he really had no idea of going into the project in 1995 were (1) the importance of his father in his life, (2) the importance of this network of young lay friends that began to form around him in the late 1940s in the evolution of his priesthood and bishopric, people remained friends with him until the end of his life, and (3) the recognition of the absolute centrality of his experience in the Second World War in his life. That was the vocational and human crucible out of which this remarkable personality was formed. You can’t get at Wojtyla unless you get at the Polish experience during the Second World War. 5th segment: Scot recalled the virtues imparted to Karol Wojtyla by his father that stayed with him throughout his life. He asked George about some of Karol’s father’s virtues and whether he believed there might be a cause for canonization open for him someday. George said he thinks it would be difficult to find records for that now and there’s been no cult that he’s aware. We don’t have beatify or canonize people to say that they are great souls. He thinks John Paul’s father was manifestly a great-souled man. The most important thing that young Karol learned from elder Karol is that prayerfulness and manliness go together. They are not antinomies and not opposites. You’re not wimpish when you get on your knees to pray or confess. You grow in humanity and your manliness. That and the integrity of the man in raising him. Fr. Chris noted that John Paul’s mother died at a young age and that he had a great love for the Blessed Mother. He has been impressed by the great devotion to her by John Paul and the whole Polish people themselves. George said in John Paul’s case, while deeply appreciating simple Marian piety, he had a very sophisticated Marian piety. Attempts by various people to read this psychoanalytically, as if his Marian devotion was some sort of substitute for his mother are ridiculous. To try to read his Marian piety as if it’s the same as peasants coming to Czestochowa is equally ridiculous. He had a very theologically sophisticated view of Mary’s role in the economy of salvation. He learned some of this from the 17th-century French theologian St. Louis de Montfort and a lot of it from Hans Urs von Balthazar, the 20th century Swiss theologian, about Mary’s discipleship being the paradigm of all Christian discipleship. That’s what John Paul as Pope proposed to the world. That’s why he wanted to give us the Luminous Mysteries of the Rosary, to anchor Marian piety ever more securely in the biblical tradition of the Church and in Christology. Mary’s role in the Church is to point us to her Son and in pointing us to her Son, she points us to the Trinity. She’s always pointing beyond herself: “Do whatever He tells you” are perhaps not accidentally the last recorded words of our Lady in the New Testament. Fr. Chris said George is working on a new book, “The Station-Churches of Rome.” He asked how it’s coming and when expects it come out. George said he has just come back from two months in Rome making the entire station-church pilgrimage with his son Stephen and a colleague, Elizabeth Lev, daughter of Mary Ann Glendon, a familiar figure in New England. The book will be out in time for Lent 2013. It will include some marvelous photographs of the station-churches in Rome taken by Stephen; an introduction to the art and architecture of each of these churches, many of which are largely unknown and some of which are simply fabulous; and a commentary on the liturgical texts of the day, both Mass and the Office of Readings of the Liturgy of the Hours. The book will be a way to make the Roman station-church pilgrimage of Lent and Easter Octave in the comfort of your home. Scot said that it’s a devotion that the North American College seminarians and priests like to get up for at a very cold 5:30am to get to the station-churches and it’s a wonderful way to pray through the season of Lent. Scot thanked George for being on the show. Scot then said to Fr. Chris that it was wonderful to hear about Bl. John Paul II from someone who knows him so well. New today we are starting a new email list that will send a daily email with shownotes and a link to the show to subscribers. Go to the TheGoodCatholicLife.com and click on the link to subscribe or email us at LIVE@thegoodcatholiclife.com. The email will go out about 5:15 or 5:30pm each day.